Crisis In Ukraine: Gunmen At Airport; Yanukovych Vows To Return : The Two-Way Russian officials say the men in unmarked uniforms are not from their forces. Ukrainian authorities say otherwise. The ousted president is in Russia and says he will "fight" for his nation's future. We'll be adding updates as the day continues. 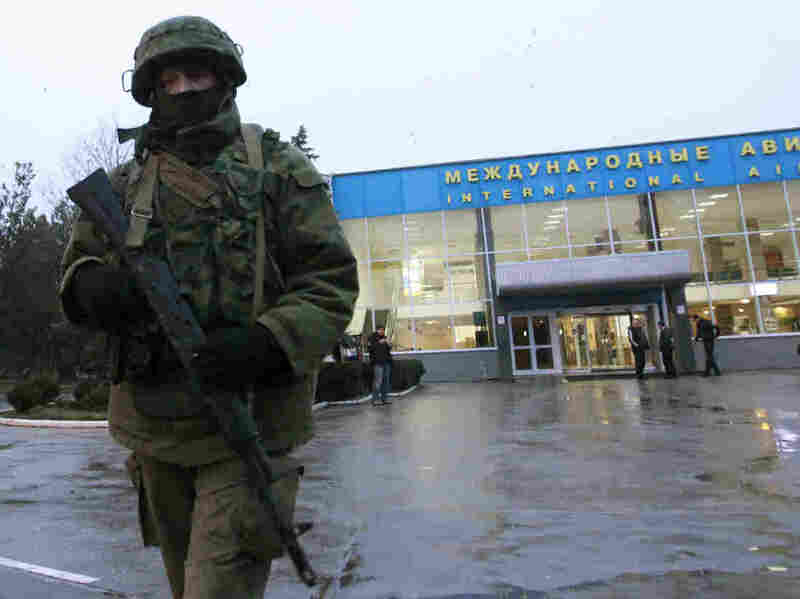 On Friday, armed men took control of the international airport in the city of Simferopol, on the Crimean peninsula. Gunmen took control of another airport in Crimea, as well. The crisis in Ukraine took another ominous turn when gunmen in unmarked military uniforms on Friday took control of two airports on the Crimean peninsula — where the majority of people are ethnic Russians and many want to break away from the new government in Kiev. President Obama spoke about Ukraine and Russia Friday afternoon, saying the U.S. is "deeply concerned" by reports that Russian service members might be playing a role in new developments in Ukraine. You can read more details of the president's statement in a separate post. Speaking to NPR's Newscast unit from Sevastopol, journalist Jessica Golloher says she was stopped by armed men in large trucks that bore Russian flags. The would not say whether they were Russian or Ukrainian. "A lot of people, the Russian-speaking population, feel they are going to be targeted by the Ukrainian government," Golloher said. She said that finding out who is in charge is the "million-dollar question," and that the masked men "basically disbanded the government" in semi-autonomous Crimea. There was no violence reported. No shots were said to have been fired. But Ukraine's new interior minister, Arsen Avakov, wrote on his Facebook page that "military units" from the Russian Navy fleet based at Crimea's Black Sea port of Sevastopol were at one of the airports. At the other airport, Avakov wrote, the men "[did] not hide their affiliation to the armed forces of the Russian Federation." Avakov's claims were dismissed by Moscow. "Russia's Black Sea Fleet has denied that Russian servicemen are taking part," the BBC says. But there was word from Reuters that "more than 10 Russian military helicopters flew from Russia into Ukrainian airspace over the Crimea region on Friday." Videos showing what appeared to be those aircraft popped up on YouTube and on newssites late in the day. Eight Russian transport planes has landed in Crimea, says a spokesman for the Ukrainian border service. The AP reports that the planes "were given permission to land, one after the other, at Gvardeiskoye air base, north of the regional capital, Simferopol." At the White House, spokesman Jay Carney said the U.S. is deeply concerned about the reports that the gunmen might be Russian soldiers. Pressed on what the U.S. would consider to be "intervention" in Ukraine, Carney said "some reports ... suggest intervention [by Russia] and we're concerned about those." The U.S., he said, is "watching closely to see whether Russia might be crossing the line." And what might constitute "crossing the line?" Carney said he wouldn't "speculate or frame it beyond the reports we've seen." The developments follow Thursday's takeover of government buildings in Crimea by pro-Russia gunmen and a vote by the parliament there to schedule a referendum on whether the region should demand more autonomy. The new government in Ukraine has announced it will ask Russia to extradite Yanukovych, so that he can face mass murder charges stemming from the deaths in Kiev last week of scores of protesters. Yanukovych has also been accused of corruption, and Ukrainian authorities claim he's responsible for the disappearance of billions of dollars in government money. As NPR's Michele Kelemen reported Friday on Morning Edition, while all this goes on, "the U.S. says this should not be a zero sum game, and Ukraine should not face a choice of East versus West, but that's not an easy case to make." Secretary of State John Kerry, she added, "says he received assurances from Moscow that it will respect Ukraine's territorial integrity." Also Friday, Bloomberg BusinessWeek writes, "Ukraine's new government said it had enough reserves to pay all creditors as the country started negotiations for an International Monetary Fund loan." But BusinessWeek notes that Ukraine's currency, the hryvnia, "[has] plunged to a record low this week as ethnic tensions at home and Russian military maneuvers nearby rattle investors."